ART FULL MUSINGS: So far, so good...more to come, maybe.. So far, so good...more to come, maybe.. 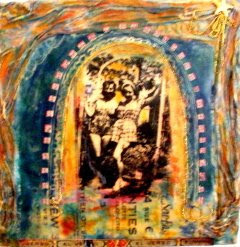 Here is my encaustic challenge piece with a bit more detail, some collage elements and lots more copper. It is begining to get there...maybe it is done, or maybe not. But the articulation of the archway is a bit more honoring of the playful and happy young women they were at that time in their lives. I will post a more completed version when its done, but I must sit with it a bit and see what calls to me...and what the piece seems to be asking of me. I really enjoyed working with the nylon and pattern piece. Nylons actually are a very good sculptural element for encautic...who would have guessed.